It sounds like a simple question, but many small business owners can’t answer it well. Listen to me — these can’t be your answers. They’re too broad. They’re too vague. And they’re not doing anything to help you find and connect with great prospects for your business. Not having an ideal customer in mind, or having a target that’s too broad and general, will leave you with messages that fail to resonate with anyone, few referrals for work you’re interested in doing, and a business that looks and sounds just like thousands of others out there. Imagine, instead, knowing exactly who your ideal customers are, and focusing everything you do on finding them and serving them well. Know how to spot the right customers, and avoid the wrong ones. Know the most valuable aspects of your offering for your ideal customers. Know the messaging that will resonate with them, and the language to use. Know where to find them, and what to say when you do. Have a passionate community that tells other people about your business. Have a perfect description of your business that you deliver naturally and confidently. Have enough of the right customers that you can turn the wrong ones away. Have more success, with less stress. I call this finding your Audience Axis. You understand your ideal customers, and they are the central focus of your efforts. They can’t help finding you, and when they do they can’t believe their lucky stars. They’re thrilled, your business flourishes, and everybody’s happy. 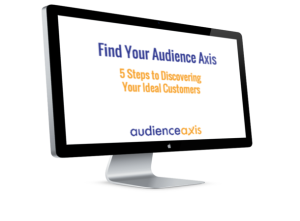 Do you want to find your Audience Axis? Of course you do! Identifying your ideal customers isn’t a one-time activity. This is not a box you get to check off and forget about. Discovering and refining your definition of an ideal customer is a discipline – a practice you need to do every day in your business. Why? Because your business will change. Your insight into your customers and prospects will change. And what you want, and what they want, will change. So you need a simple, easy-to-use practice that helps you constantly view your business from your customers’ perspective and your own, and think about how to make that ideal fit happen. 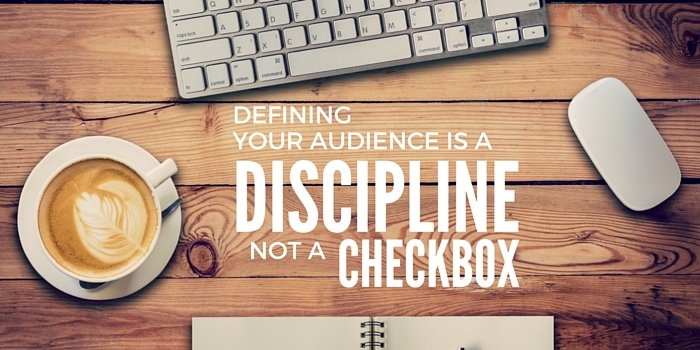 You need to know not only who your ideal customers are today, but to be able to refine your audience definition and discover new audience opportunities as they arise. You need a process you can use every day. That practice is what I want to teach you. The right person for the job: You. Many of us find the effort to define our ideal customers — or personas, or audiences, or whatever — so intimidating that we just never get it done. We’ve become convinced that we can never know enough about demographics, metrics, consumer behavior, marketing or whatever else to figure this out on our own. We’ve been told that we need somebody else to do this for us. This is YOUR business. These are the people YOU want to serve. YOU can figure out the right fit. It takes a little work, but it’s not rocket science. Even if you’re not a marketing whiz, with a little imagination, some thoughtfulness and a little dedication you can learn how to discover and refine your ideal audiences. Are you ready to change how you think about your customers? 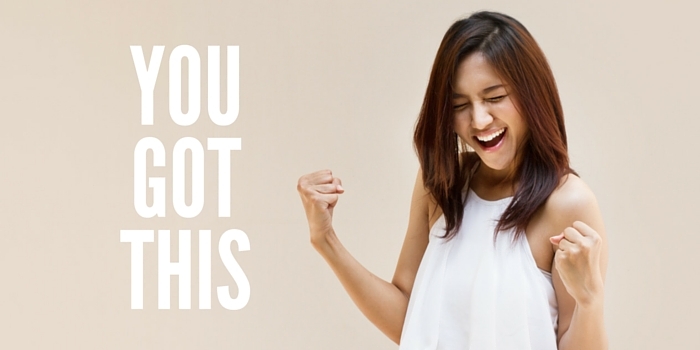 Are you ready to finally have an answer to that dreaded, frustrating question? 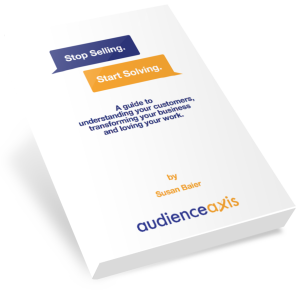 This short read will give you a sneak peak at a mind-blowing, simple and powerful approach to discovering and defining your ideal audiences. Step 2: Take my online course, “Find Your Audience Axis“. 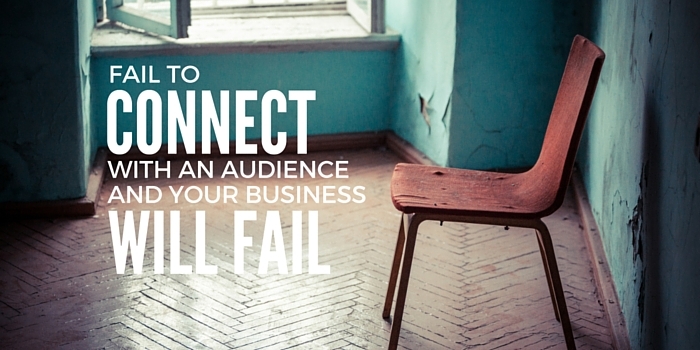 It offers a simple, straightforward approach for identifying your ideal audience. Each module will take you about 15 minutes to watch, and then you’ll have some homework to do. It’s manageable, it’s fun, and you’ll finish with a new perspective about your business, and new clarity about what you’re doing and who you’re doing it for. You’ll learn an easy approach to use when evaluating prospective customers, or finding new markets. You’ll also join a lively community of amazing people using this same process to find their ideal audiences and redefine what they do every day. Give it a try, and give your business its best chance to succeed.